Super Fantasy is the first hack'n'slash board game in which up to six players take on the roles of brave and unique heroes. During each game, players embark on tricky and mighty quests into ever-changing dangerous caves and dungeons swarmed with monsters and terrible creatures that try to slaughter them, while heroes try to gain treasures as well as better equipment in order to complete the missions. Since hordes of monsters repeatedly cross the path of our heroes, bloody clashes are inevitable in order to achieve victory! That is why Super Fantasy uses a simple yet unique dice-based system. Players have a pool of six dice to roll that they manage according to the action they want to perform (such as movement, attack, etc.) and its effectiveness. Each face of the dice shows either a 1, 2 or the Special Power symbol and the sum of the results shown represents the effectiveness of the action performed by the heroes. Every time the Special Power symbol occurs, the hero can choose to charge one of his abilities; once fully charged, the hero can unleash its power against the enemies! 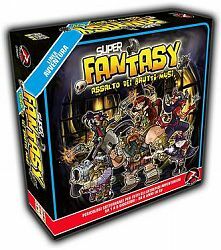 Super Fantasy features double-sided modular board pieces for creating countless scenarios combinations, six mighty heroes and three unique and powerful abilities for each hero, throwing players into a fast-paced world in which anything can happen!